The true scale of Tory failure on tax avoidance is revealed today with Labour figures showing the chancellor has missed his target by more than £2.1bn. 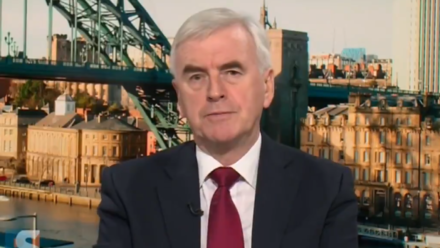 John McDonnell demanded an “urgent change of direction” as he published research showing a vast gap between reality and the sums promised by the coalition from 28 tax changes. The information, produced by the Office of Budget Responsibility (OBR) and obtained via freedom of information laws, comes after shadow chancellor McDonnell demanded tough new measures when he visited the World Economic Forum in Davos last week. McDonnell said the government’s tax avoidance measures had “utterly failed”, and that for the Tories tax avoidance is “an acceptable practise for the super-rich and big business whose interests they serve”. “The chancellor is still planning to continue with his party’s record of failure on tax avoidance, while at the same time pursuing his austerity agenda and handing out billions in tax giveaways to the same wealthy elite that fund their party,” he added. The gap between coalition expectations and reality amount to over £2.1bn, with offshore evasion accounts accounting for the biggest failure as £649m went uncollected. McDonnell made global tax avoidance and evasion the focus of his visit to the World Economic Forum last month, in which he attacked “the Davos elite” and said Labour would launch “a global drive against tax dodging and financial secrecy” to affect radical change. He suggested accountants should take a global Hippocratic oath vowing not to help companies avoid tax. Last week Jeremy Corbyn and McDonnell both published their tax returns in full for the third year running, and called on the prime minister to do the same. David Cameron made his tax return public, however Theresa May and Hammond have refused.